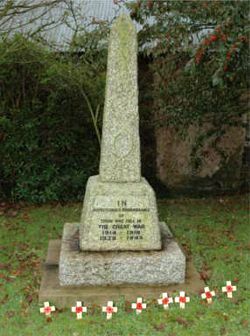 Outside, in a corner of the churchyard of the Parish Church of St. James in Chawleigh, stands a small granite obelisk originally erected after the First World War and adapted after the Second Great War as a point of remembrance for the dead of both wars. In affectionate remembrance of those who fell in the Great War 1914 - 1918. A small poppy wreath is carved at the base of the stone column. 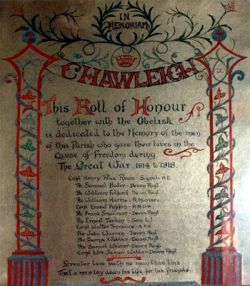 Inside the church, hung in an obscure corner at the back of the organ, is a Roll of Honour hand-painted on a parchment sheet and mounted within a wooden frame. This states that it was intended to accompany the obelisk in the churchyard and carries the names listed below of those who fell, in the cause of freedom, between 1914 and 1918. Captain Henry Price Rowe of the 3rd/1st Wessex Div. Signal Coy. Son of William Ellis and Mary Price Rowe and husband of Josephine Rowe. Born in Hampstead in the September Quarter of 1889. Died 6 November 1918 aged 29. Buried in the churchyard of St. Mary's, Brixham. Private Samuel Bater of the 8th Battalion, the Devonshire Regiment. Son of Samuel and Diana Bater of Chulmleigh and brother of Mrs. Margaret Ann Sanders of the "Barnstaple Inn" Chulmleigh. Born in 1900 in Chittlehamholt. Died 6 September 1916 aged 16. Awarded the Military Medal. Believed to be Private William Fulford of the 8th Battalion, the Devonshire Regiment who was born in Birmingham in 1888 and killed in action 26 October 1917. Private William Harris of the Royal Marine Light Infantry, HMS Formidable. Son of John Harris who lived in Chawleigh before moving to London. Born in Chawleigh in 1889. Died 1st January 1915 aged 26. Corporal Ernest Rippin of the 16th (Devon Yeomanry*) Battalion, the Devonshire Regiment. Son of George and Matilda Rippin of Hill Town, Chawleigh. Born in Colebrook in the June Quarter of 1887. Died 19 January 1917 aged 29. *Both Rolls of Honour describe this man as being in the R.N.D.H - the Royal North Devon Hussars who became the Royal North Devon Yeomanry in 1908 and fought in the Great War as the 16th Battalion of the Devonshire Regiment. Private Frank Smallman of the 1st/6th Battalion, the Devonshire Regiment. Son of Mrs. Catherine Smallman(w). Born in Dublin in 1897. Died 8 June 1916 aged 19. Private Ernest George Tonkins of the 8th Battalion, the Somerset Light Infantry. Son of Charles and Jane Tonkins. Born in Chawleigh in the March Quarter of 1897. Died 12 July 1917 aged 20. Corporal Walter George Tremain of the 95th Brigade, the Royal Field Artillery. Son of Elias and Augusta Tremain of Bare Hill, Chawleigh. Born in Chawleigh in the December Quarter of 1894. Died 15 September 1916 aged 21. Private John Warren of the 8th Battalion, the Devonshire Regiment. Son of George and Emma Warren of Hardings, Leigh Cottage, Chawleigh. Born in Chawleigh in 1893. Died 2 July 1916 aged 23. Private Henry George Webber of the 9th Battalion, the Devonshire Regiment.Son of William and Emily Webber of Chawleigh. Born in Chawleigh in 1875. Died 1 July 1916 aged 41. Private Samuel Webber of the 1st Battalion, the Devonshire Regiment. Son of the late John and Ann Webber of Chawleigh and brother of Miss Ann Webber, 6 Hellingbourne Rd., Herne Hill, London. Born in Chawleigh in 1881. Died 19 June 1916 aged 34. Corporal William James Webber of the 1st/6th Battalion, the Devonshire Regiment. Son of James and Fanny Webber of East Street, Chulmleigh and husband of Emma J. Webber of 2, Fore St, Chulmleigh. Born in Chawleigh in 1885. Died 8 March 1916 aged 31. Ronald Pinn lost his life at the Battle of Arnhem. He was the son of Henry and Bessie Pinn of Okehampton and he died at the age of 26. Henry Pinn and his wife Bessie (formerly Shapland) both came from the Chawleigh area.